32mins: And indeed it's the Brazilian who takes the set-piece, which forces Adrian into a low save! West Ham really are defending in numbers here and making life for Chelsea very difficult. The Blues, though, get another corner, which Fabregas takes to find Zouma. The defender heads the ball towards goal and Lanzini somehow manages to clear it off the line - although the Chelsea players appealed as the ball appeared to go part over the line. 35mins: Straight down the other end, Collins' header tests Begovic, but the Blues goalkeeper comfortably saves the defender's effort. So goal-line technology has been used and it's confirming that Zouma's header was an inch on the line. Just. I don't think Mourinho will accept that, though, as it looked VERY close. 38mins: MISS! West Ham should be 2-0 up after Payet's header evades Zouma before Lanzini goes one-on-one with Begovic - but chips the ball over the net. 41mins: Chelsea manage to get the ball into the back of the net - but Fabregas, the goalscorer, has been flagged as offside. Mourinho has just gotten off the bench to say something to the fourth official before entering Bilic's technical area to also make his views on that offside call known to the linesman. He's back in his area now but not looking happy. There's a scuffle going on between both teams - which the fans are adding to - but Matic has now been sent off for a second bookable offence! And now Fabregas has gone in the book for complaining about the decision. Chelsea have to be very careful here that another player doesn't get sent off. Drama here at Upton Park! Mourinho's assistant has now been sent to the stands! Half-time: West Ham lead Chelsea by one goal to nil while the Blues are down to 10 men after Matic was sent off. Just to confirm why the midfielder was shown a red card. Matic received a yellow card initially for pulling back Kouyate and then was sent off minutes later for a foul on Sakho. Completely unnecessary sending off for the midfielder, who has been criticised for his performances this season by Mourinho. The Chelsea boss won't be happy after this. Chelsea are already out on the pitch as Mourinho brings on Mikel for Fabregas. We'll have full updates on the Chelsea coach's location shortly... To confirm, though, he WASN'T sent off. It seems Mourinho has left the touchline and is in the directors' box! We're hearing that Mourinho had a word with the referee at half-time and was sent to the stands. Will his stadium ban be invoked now, we wonder? Chelsea's press officer has confirmed the sending off for Mourinho. Eek! GOAL! CAHILL EQUALISES FOR CHELSEA! 56mins: West Ham fans have been left absolutely stunned after Willian's corner kick falls to Cahill at the far post before the defender drives a low shot past Adrian and into the net. 1-1! 63mins: Willian's free-kick is headed clear by Tomkins. - That was Cahill's first Premier League goal in 350 days. 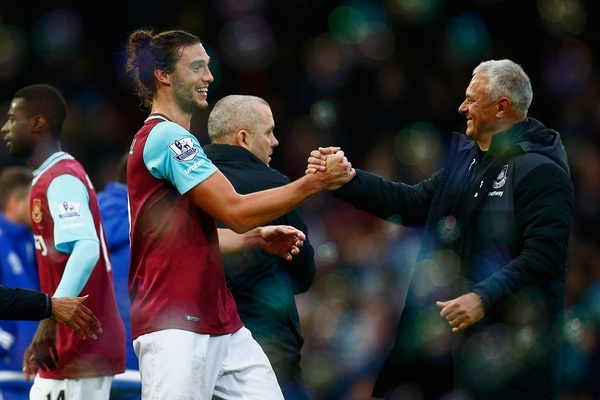 SUB: Zarate comes off for Andy Carroll. This second half has been a bit of a mish-mash, it has to be said. No real chances, or real flow, for either side. 74mins: West Ham get a corner kick, but Terry does well to head the ball clear. At the other end, Hazard latches onto the ball, passes to Ramires in the middle but the Brazilian scuffs a shot into the path of Adrian. 75mins: GOAL! CARROLL GIVES WEST HAM THE LEAD! The roar of the West Ham fans is absolutely deafening! And the goal comes about after Terry fails to clear the ball well enough before Cresswell has the space and time he needs to whip a cross into the area which Carroll heads in past Begovic! 2-1 to West Ham! Yet another scuffle has broken out here after Willian makes a challenge on goalscorer Carroll, for which he receives a yellow card for. Lanzini is now coming off after a superb showing here for Obiang. Meanwhile, Falcao comes on for Ramires. West Ham have looked bright in this second period, but Chelsea get a free-kick in a dangerous position for Sakho's foul on Willian. And that's it! West Ham beat 10-man Chelsea 2-1 at Upton Park to keep up their fine season. It was a controversial affair with Matic being sent off, Mourinho being sent to the stands while his assistant was also sent off. Even Cahill's goal couldn't save the Blues - and we wonder what kind of mood Mourinho will be in in his post-match press conference. The Chelsea players have gone over to applaud their fans while the Hammer supporters are in jubilant spirits! We're positioned at the post-match press conference, but we're hearing Mourinho has gotten onto the team bus and apparently will NOT be doing his media talk. So to confirm: Mourinho did NOT appear for his post-match press conference while Bilic praised Carroll for his fine winner today. There will be more reaction from the game on the site but, for now, good night!